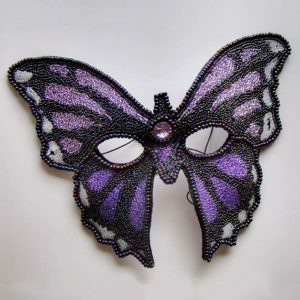 Beautiful new costume/masquerade mask in iridescent black, white and purple beads, pink silverlined beads, and a lovely lavender Swarovski Rivoli crystal. A classic masquerade mask suitable for any costume party, or for display as fine art. Shipping is included in the price for the US and Canada. For shipping to any other location, please inquire in advance, and we will prepare a quote for any extra shipping charges. Starburst Zodiac Beaded Guitar is my latest embeaded guitar. 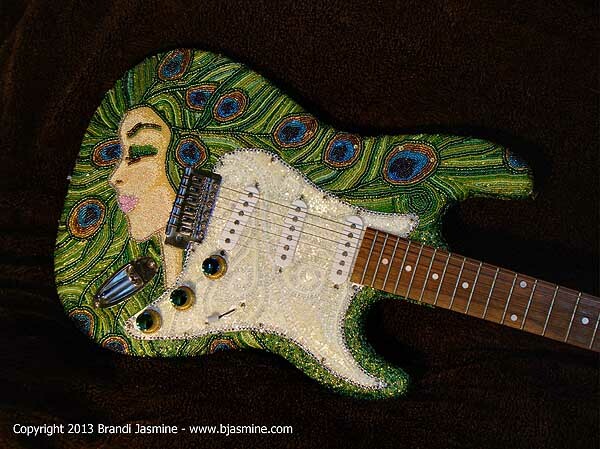 This guitar’s theme is the astrological zodiac. 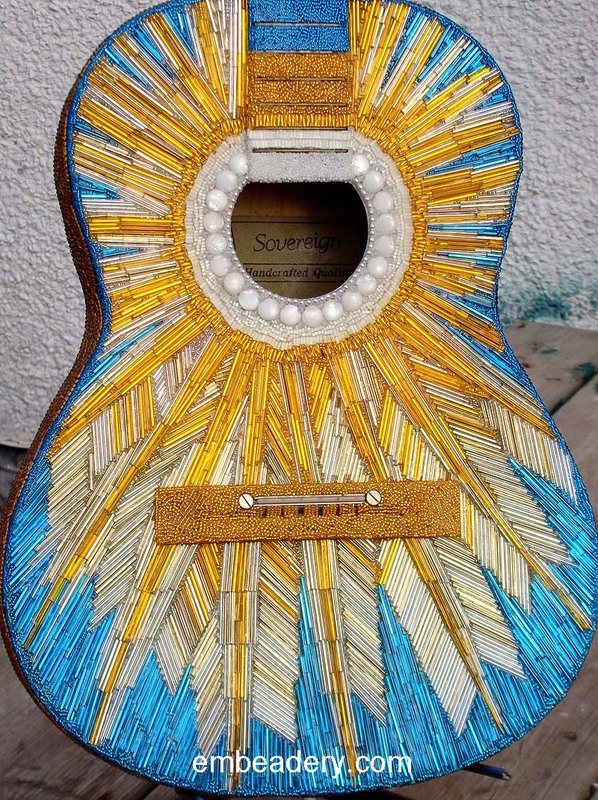 The front of the acoustic guitar is an homage to the sun at midheaven, at the zenith of it’s strength and power. There is a ring of real shell beads and faux pearls at the focus. The remaining area is covered in different lengths of bugle beads. 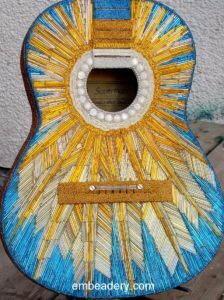 The neck is also beaded, and the guitar has been strung with multi-color guitar strings. 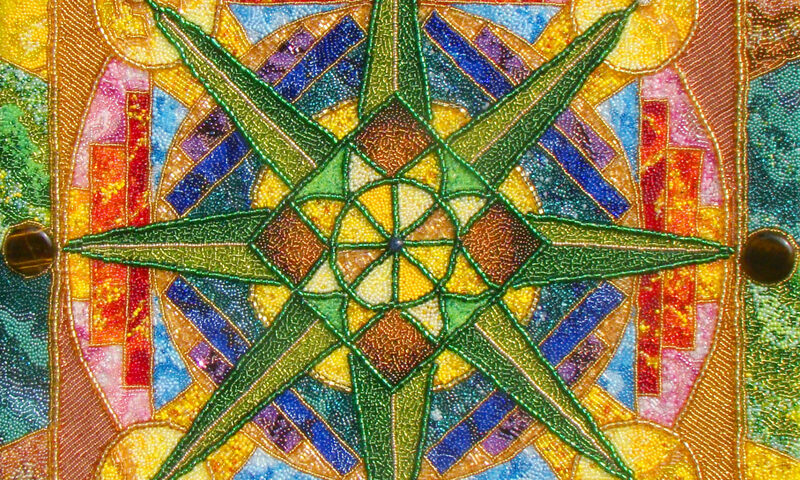 The back of Starburst Zodiac is a stylized zodiac chart, with each of the astrological elements and modalities represented in colors. Each sign is represented with a silver-colored stamped astrological coin, and there are 12 shell “stars”, one for each sign of the zodiac. 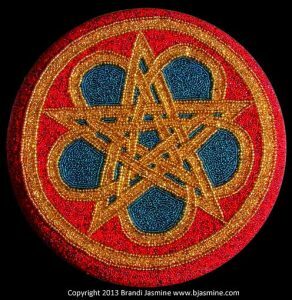 The outside edge of Starburst Zodiac is a Celtic knot design in gold, red and blue. The back of Starburst Zodiac also features a Sun and Moon design. 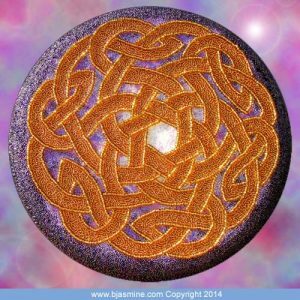 This theme is a favorite, I keep coming back to it in the many different styles of art I produce. 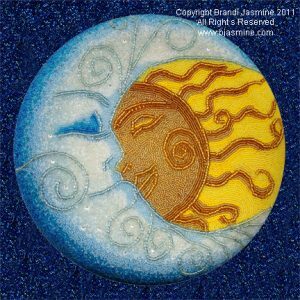 This time, I added a planet behind the half-moon, I wasn’t thinking of a specific planet, but it could be Neptune, with those colors! Asking Price for Starburst Zodiac is $2,999. Price includes shipping to the US or Canada. 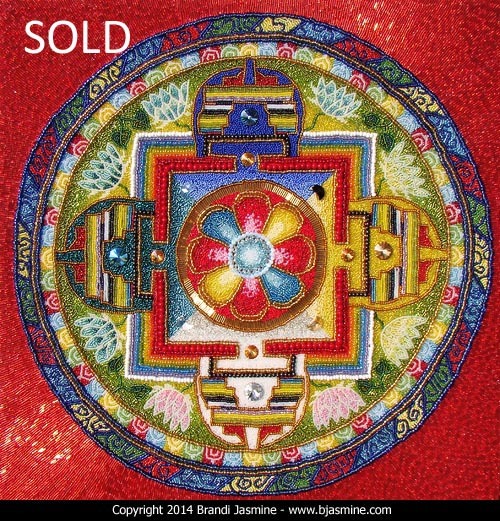 Contact me for shipping pricing elsewhere. Escrow can be arranged upon request, provided the buyer covers any escrow fees. I know I haven’t posted any new embeaded art in a while. That’s because I have been working on a huge beading project. 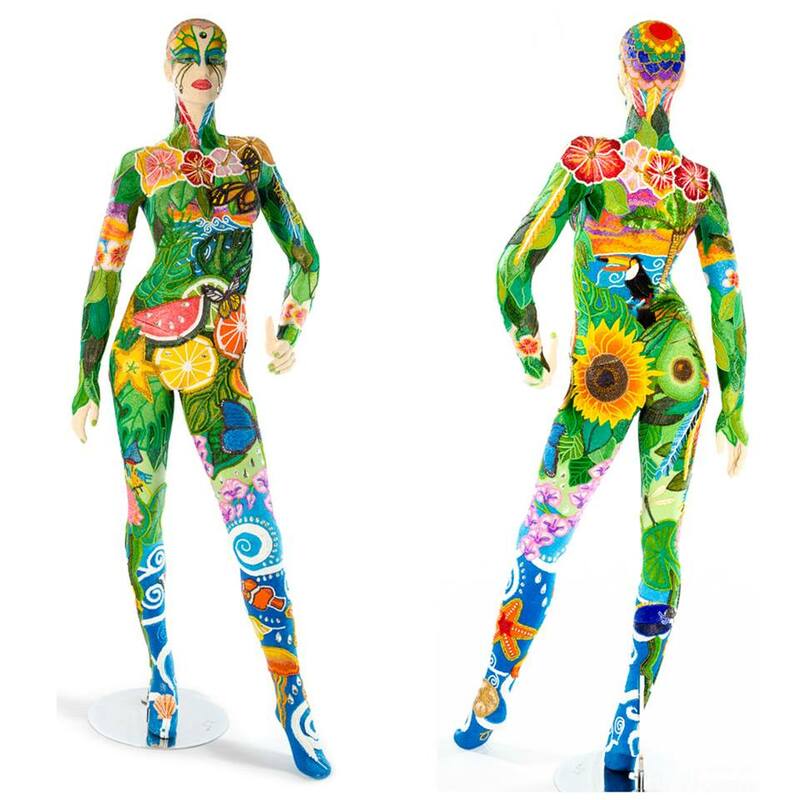 Jade is a life-sized mannequin that was commissioned by John Bead Company. The tropical embeaded design was a collaboration between myself and John Bead’s Creative Director Fernando DaSilva. Fernando presented the tropical theme, and gave me the specific motifs to use. We worked together to refine the design as I worked down Jade’s body. “Represent the lusciousness of a tropical land,” he said. 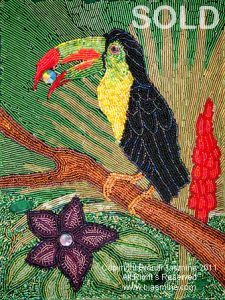 “After you submitted several sketches, I was impressed on how well you captured my vision and make it into reality.” It took more than a year to fully complete this project, thousands of seed beads, and hundreds of hours doing the beading. 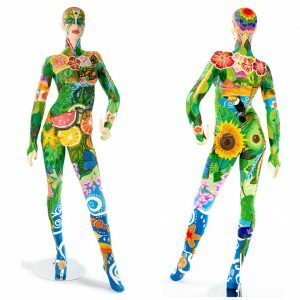 Jade the beaded mannequin has already seen more of the world than I have, I think! It was a real pleasure to work with Fernando and the staff at John Bead and I hope to do it again! If you are in Toronto and you have never been to their warehouse or the Outlet Store, it’s a beader’s paradise, at 20 Bertrand Avenue, Toronto. Visit www.johnbead.com for hours/directions. 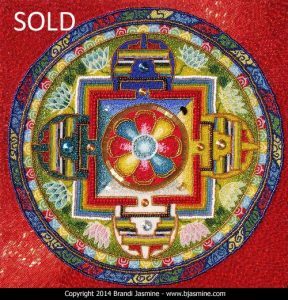 The warehouse is wholesale only, but their Outlet Shop is open to the public, and if you are a bead fanatic like me, you will love it. Here are a few samples of my embeaded artwork. Each piece can take weeks or months to complete. 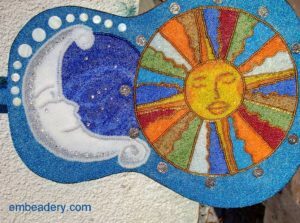 I do not use traditional sewing techniques, instead, I have created my own unique beading tools and use an adhesive to fix thousands of tiny seed and pony beads to art canvas or sculptures. 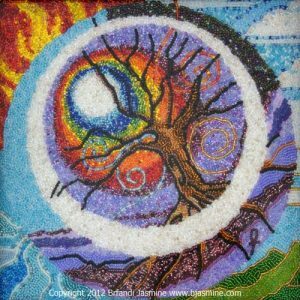 I also use precious and semi-precious stones, crystals and hand painted resin pieces to complete the desired effect. 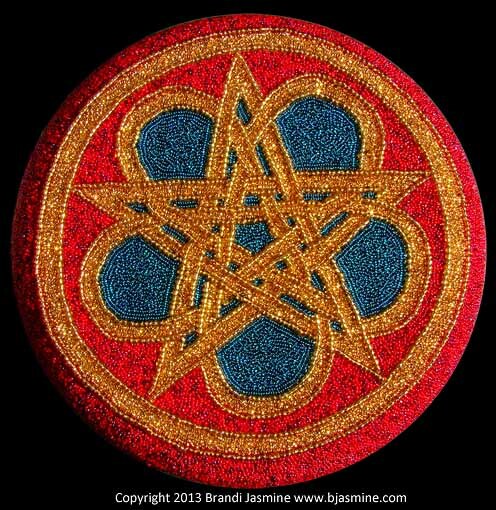 Please visit bjasmine.com for additional examples of embeaded art, to commission or purchased beaded fine art.